The Royal Opera House is an opera house and major performing arts venue in Covent Garden, central London. The large building is often referred to as simply "Covent Garden", after a previous use of the site of the opera house's original construction in 1732. 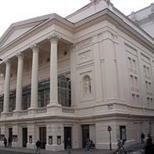 It is the home of The Royal Opera, The Royal Ballet, and the Orchestra of the Royal Opera House. Originally called the Theatre Royal, it served primarily as a playhouse for the first hundred years of its history. In 1734, the first ballet was presented. A year later, Handel's first season of operas began. Many of his operas and oratorios were specifically written for Covent Garden and had their premieres there. The current building is the third theatre on the site following disastrous fires in 1808 and 1857. The facade, foyer, and auditorium date from 1858, but almost every other element of the present complex dates from an extensive reconstruction in the 1990s. The Royal Opera House seats 2,256 people and consists of four tiers of boxes and balconies and the amphitheatre gallery. The proscenium is 12.20 m wide and 14.80 m high. The main auditorium is a Grade 1 listed building. Use Covent Garden tube station on the Piccadilly Line. There is no designated parking at the Royal Opera House for ticket holders. The nearest NCP car parks are five minutes walk away at Drury Lane and Shelton Street. There is a drop-off point outside the Bow Street entrance. A limited number of orange badge bays are available in the vicinity, but are not reserved for the use of Royal Opera House patrons. There is lift access to all levels of the main auditorium except the Orchestra Stalls, which can be reached by a minimum of nine steps and a maximum of 18. There are more than 100 seats in the Stalls Circle, Balcony and Amphitheatre which are accessible without the need to negotiate steps. In addition to this, many seats in these areas and in the Grand Tier are accessible by 10 steps or less. You can borrow a wheelchair when you visit the ROH. Please contact the box office on 020 7304 4000 to arrange this facility in advance. There are up to 19 spaces for wheelchair users in the main auditorium, which can be made available at every performance. They are in the Stalls Circle, Grand Tier, Balcony and Upper Amphitheatre level. One Box Office sales position, the Information Desk and bars have induction loops to assist customers with impaired hearing. A Trantec radio system assisted-hearing facility has been installed inside the main auditorium and the Linbury. The Clore and the Crush Room are scheduled to have the system installed in the near future. To benefit from the system, you are welcome to borrow a free set of headphones and a special receiver from the Front of House Duty Manager in the Main Entrance Foyer. The unit is designed to pick up a radio signal which amplifies the sound. Alternatively, if you wear a hearing aid, you may borrow an induction collar which can be used in conjunction with the "T" position of your aid. You may reserve this equipment in advance from the Box Office on 020 7304 4000. Assistance dogs are welcome in all spaces of the Royal Opera House. Please inform the venue before booking. For more information and to book disabled tickets, please call 020 7304 4000.